Today while I was out on my Comic book run, I stopped in to have a snack at Quizno's and there on the counter was a sked holder full of Surrey Eagles pocket schedules. I had to subvert my urge to take the whole sked holder full of skeds... I took 7 skeds and left the sked holder with two or three skeds left in it. I'll be sure to ask for a sked holder next time I make it out to an Eagles game. 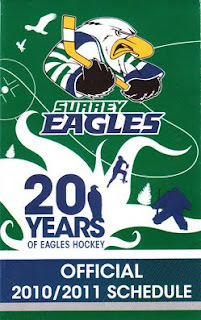 The Surrey Eagles play in the BCHL (British Columbia Hockey League).